The Drug Enforcement Commission (DEC) has arrested former Zambia Air Force Commander Lieutenant General Eric Mwaba Chimese for various criminal activities. 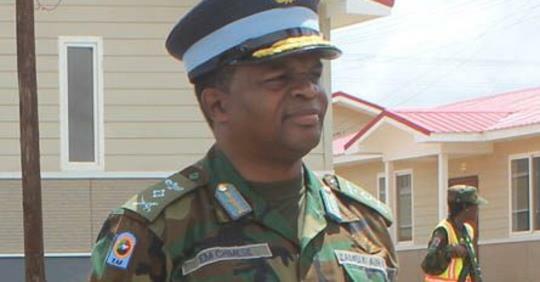 In a statement today, DEC public relations officer Theresa Katongo confirmed the arrest of Chimese, 50, a retired ZAF Commander, residing at Plot No. F/4301/3/3 Baobab area in Lusaka. She said Chimese had been arrested and jointly charged with James Chungu, 51, the Director of Chita Lodges Limited for concealing property, wilfully giving false information, abuse of authority of office and possession of property reasonably suspected to be proceeds of crime. Katongo stated that in count two, James Chungu on 31st January 2019 did wilfully give false information to authorized officers by stating that the said properties where for Chita Lodges Limited when in fact not. She added that the Commission had since seized properties which include thirteen (13) fully furnished houses, one semi-detached house and a gym all within Lusaka. Katongo said the accused persons are on police bond and will appear in court soon.